AHCC® is Japan's #1 top-selling immune support dietary supplement, now available in the United States. AHCC® (Active Hexose Correlated Compound) is an extract obtained from a hybridization of several species of mushroom mycelia. 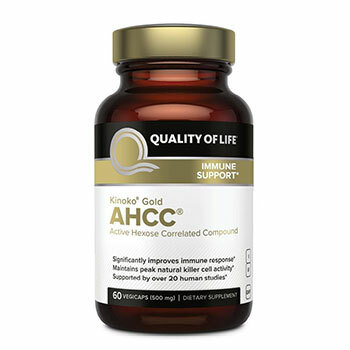 AHCC supports normal immune function and may improve the number and functions of immune system cells. It has been shown to significantly increase immune response by promoting enhanced macrophage and T-cell activity and boosting peak Natural Killer (NK) cell function. 2 capsules daily, 60 caps.